April 15. Students from local high schools on spring break touring the Cathedral of Notre Dame in Paris this morning left the historic church shortly before a devastating fire broke out. 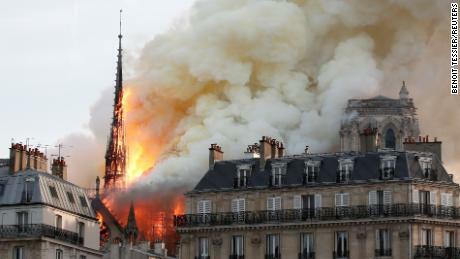 A parent said the group was safe and sound, at a nearby cafe where they watched the flames engulf the centuries-old cathedral. The trip was not sponsored by Charlotte Mecklenburg Schools. The cathedral, an icon of Christianity around the world, was begun in the 12th century by the Roman Catholic Church and modified over the centuries. It was desecrated during the French Revolution when much of its religious imagery was damaged or destroyed. A restoration was undertaken during the middle of the 19th century; with more cleaning and restoration a quarter century ago. The French Interior Ministry said 400 firefighters have been mobilized.